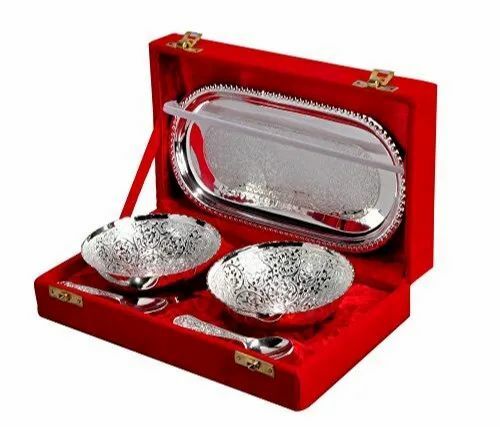 We are a Leading manufacturer of Brass Bowl, Wedding Return Gift, Wedding Gifts, Gold Plated Bowls, Sliver Plated Bowl, Decorative Items, Decorative Arts Etc. We are a Leading manufacturer of Brass Bowl,Wedding Return Gift,Wedding Gifts,Gold Plated Bowls,Sliver Plated Bowl,Decorative Items,Decorative Arts Etc. Rachana Enterprises has developed into a trustful entity and pioneered the industry by providing optimum quality Brass Product 1, Brass Product 2, Brass product 3. Due to our professional expertise, we have been the industry leaders and thus our role becomes stronger to fulfill the diverse needs of our prominent clients.